The investigation of distribution patterns of species diversity is significant for successful biodiversity conservation. 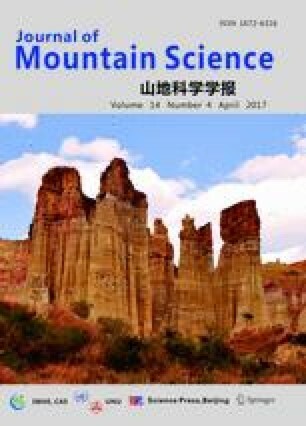 The spatial patterns of vegetation and different life-forms species diversity along an elevation gradient in the middle section of the southern slope of the Tianshan Mountains in Xinjiang, China were explored, using the detrended canonical correspondence analysis (DCCA) and the generalized additive model (GAM) methods based on a field survey of 53 sampling plots. In this work 158 species of seed plants were recorded, including 141 herbaceous, 14 shrub, and 2 tree species, in which the woody plants are very limited. 53 sampling plots were classified into 9 major plant communities. The results indicate that the herb communities were the most sensitive to changes in elevation gradient. The diversity indices of the community as a whole presented bimodal patterns. The peak values for the species diversities were found in the transition region between mountain steppe desert and mountain desert steppe (2,200–2,300m), and in the alpine grassland region (2,900–3,100m), while maximum species diversities were in the areas of intermediate environmental gradient. The main environmental factors on the distribution patterns in plant diversity were the elevation, soil water, total nitrogen, available nitrogen, organic matter, and total salt. The response tendency of the four diversity indices for the whole community to the soil environment was the same as that of the herb layers. This study was funded by the National Natural Science Foundation of China (Grant No.31360039). I am grateful to two anonymous reviewers for helpful critiques, suggestions and comments which have significantly improved the quality of theof this manuscript.